Reference number for this case: 30-Sep-54-Finistère. Thank you for including this reference number in any correspondence with me regarding this case. Brest, 3 - Mrs HENRY, farmer in Gouesnou (Fin.) has stated to have seen on Thursday (30 september) then Friday (oct 1st.) at the same hour (*), in the sky, a cylindrical craft of purple colour which moved noiselessly, from the West to the East. Mrs. Henry, farmer in Gouesnou (Finistère) affirmed to have seen twice in a row, at the same time, in the sky, a purple cylindrical machine which moved without noise from the west to the east. Still and always flying saucers! Perpignan. -- A truck driver who was collecting milk yesterday morning in the vicinity of Cabestany (Pyrénées-Orientales) said he saw in front of his vehicle a "bluish globe", bluish in color, "which evolved at an altitude of 'About 180 meters producing a very soft hum." Having stopped his truck, the driver was able to observe the evolutions of the craft for almost a quarter of an hour and then, suddenly, it would have risen in the sky and disappeared in direction of the sea. La Rochelle. -- A flying saucer would have been seen in Auge (Deux-Sèvres). Also, Mr. Picaud, the manager of a brewery in Sainte-Pozenne, said he had seen for a few minutes while on the road to Fontenay-le-Comte a curious yellow disc. Brest. - The inhabitants of Landeda and the Aberwrac'h (Finistère) saw last night at high altitude a machine of circular shape and resembling a "flying saucer". Melun. -- Several inhabitants of the commune of Rebais declared to have seen a strange, very brilliant machine, circulating at night fall in the sky, above Rebais. The witnesses specified that the craft, which was traveling very slowly, had then moved towards Coulommiers, having increased its speed, and had disappeared. The day before yesterday morning, the CRS, also saw a bright disc in the sky, above Vaudoy. Montpellier. -- Mrs Picot de la Baume, a resident of Montpellier, stated that at an altitude of about 1,500 meters she saw a cigar-shaped device, which was shiny and appeared to be surrounded by a halo. The machine, which she could observe for a minute or so, suddenly disappeared in an easterly direction, without making a sound or leaving a trace. Casablanca. -- Reliable witnesses saw in the sky of Kourigra, about 130 kilometers from Casablanca, a circular, red-colored machine, evolving at high altitude and at high speed, which seemed to be spitting green blue flames [as a meteor would do]. Saint Brieuc. -- Several people said they saw 300 or 400 meters from them last night, around 8 pm. 45, a "flying cigar" at an altitude of about 50 meters. The machine, they said, could be 13 meters in length and lit up intermittently with pink gleams. He moved noiselessly. Brest. -- Mrs Henry, a farmer in Gouesnou (Finistère) said she had seen a mauve cylindrical craft moving noiselessly from west to east on Thursday and Friday in the evening at the same time. Lille. -- Anicet Corneille, an agricultural worker, said he saw a cigar-shaped device in Comines last night, 8 to 10 meters long by 3 meters wide, which was about 40 meters Height and exuded a lively violet glow. After flying over the city for a few seconds, the craft would have disappeared into the sky. Mr. Corneille's statements were confirmed by a Touring engineer passing through Comines. Montceau-les-Mines. -- Two bricklayers, MM. Romain Sebastiani and Buratto, both cyclists, said they saw a craft take off with a shrill whistle along the road from Blanzy to Montceau. The apparatus had, they said, the shape of a very dark yellow cigar, a length of three meters and a diameter of about 50 to 80 centimeters. An inhabitant of the Meix, a village near Seurre, Mr. Lucien Minet, 19 years old, has in turn found a strange appearance. He was standing by the doorway at about 9 o'clock in the evening, when he saw in the sky a green glow moving slowly. A whistling accompanied this apparition which lasted fifteen seconds. The young man had time to call his mother, who could also see the phenomenon. Two young Dolois have seen twice "saucers"
Dole (C.P.). -- The two young Dolois, Jacky Chapoutot and André Lacour, who "saw a flying saucer" last week in Dole, noticed the same phenomenon Wednesday, around 8 pm, while they were at two different points of the city. "I did not believe in flying saucers," Jacky Chapoutot told us, "but this time I'm sure of what I saw, and I'm particularly interested in aviation and what was going on in the sky of Dole was moving at a speed that certainly is not yet achieved in the machines we know. I must add to be complete, that last week, as this time I heard, when this saucer appeared, an airplane hum that seemed to evolve without navigation lights." Nevers (C.P.) -- An agricultural worker, Raymond Delovre, 20 years old, saw between Saint-Pierre-le-Moutier and Langeron a kind of disk moving towards the N.-E. This celestial body emitted a Bright orange light while a yellow light gushed to the rear. The appearance was maintained on a horizontal plane and was noticed for a few seconds." A farmer, Mrs. HERRY, wife of a merchant of pigs, well-known in our area, being in her room, saw a purple cylindrical machine which moved without noise and quickly from the West to the East. Mrs. HERRY was so much struck by this phenomenon that she asked her daughter-in-law to come to see it. By the time the latter went up to the above floor, the "saucer" had disappeared. The FOLLOWING DAY, OCTOBER 6, at approximately the same time, Mrs. HERRY had the opportunity to attend the same appearance. "L'OUEST JOURNAL" (Rennes) for October I0 1954. p. 2 Research of Archives by Mr. JEANTHEAU (Créteil). There seems to be a wrong set of date and wrong witness name in the above transcript. All other sources, including one of which I provide a photocopy here, indicate that it was September 30 and October 1st and not October 5 and October 6. The witness' name is also in balance, it is Mrs Henry in all other sources. A witness saw on two evenings following, per same hour, a purple cylindrical machine which moved without noise, from EAST to WEST. "RESISTANCE DE L'OUEST" for OCTOBER 4, 1954. Thursday evening, Mrs. Herry, farmer in Gouesnou saw in the sky, at 19 hours, a cylindrical purple machine which moved itself without noise from the west towards the east. Yesterday evening, at the same hour and being at the same place, Mrs. Herry was witness of a similar appearance. 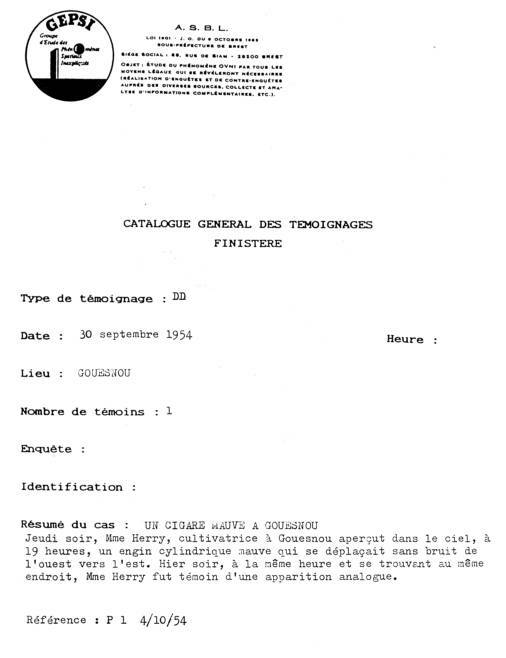 Luc Chastan indicates that in the Finistère in Gouesnou, on September 30, 1954, at an unknown hour, "a farm woman claimed to have seen twice in continuation on September 30 and on October 1, at the same hour, in the sky, a mauve cylindrical craft which moved without noise, from west to east." Luc Chastan indicates that the source is "Le Méridional". Sunset at 08:06 P.M. on September 30, 1954 in Brest. Not looked for yet. Airplane, helicopter, astronomical? 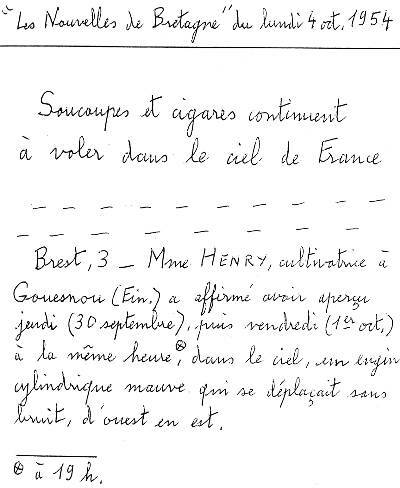 [nb1] Newspaper article manuscript transcript, Les Nouvelles de Bretagne, October 4, 1954, personal file. [un1] Article in an undetermined newspaper of October 1954, personal file. 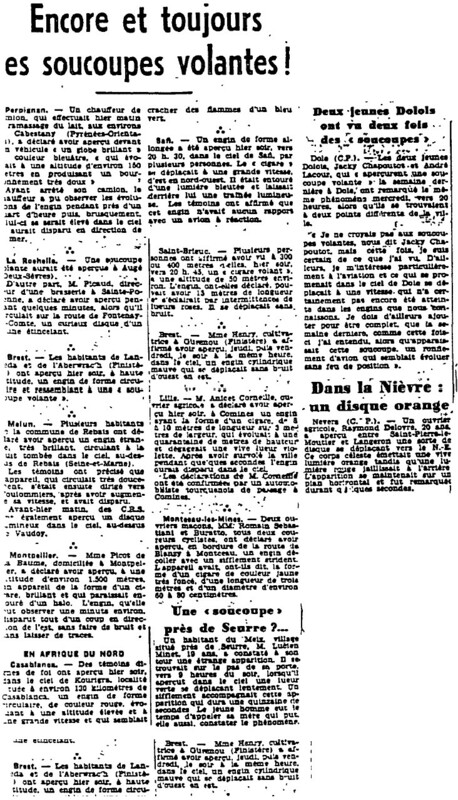 [---] Article in the regional newspaper La Résistance de l'Ouest, France, October 4, 1954. 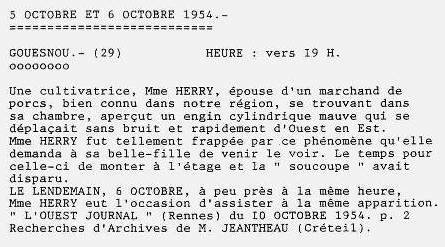 [---] Article in the regional newspaper Les Nouvelles de Bretagne, France, October 4, 1954. 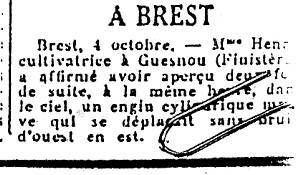 [pr1] Article in an unknown newspaper, France, October 5, 1954. [---] Article in the regional newspaper L'Ouest Journal, France, October 10, 1954. [pj1] Typewritten notice by Philippe Jeantheau, unknown date, for the LDLN catalog. [pm1] Typewritten notice by Philippe Milon, unknown date, for the LDLN catalog. [ge1] Case sheet, ufology group GEPSI, the Finistère, undated, France. 0.1 Patrick Gross April 17, 2005 First published. 1.0 Patrick Gross March 5, 2010 Conversion from HTML to XHTML Strict. First formal version. Addition [lc1]. 1.1 Patrick Gross December 22, 2016 Addition [pr1]. This page was last updated on December 22, 2016.